Detailed Logging makes it easy to find and resolve errors. When FinalBuilder runs a build, the output and status of each action is logged to the Build Log. If the build stops because of an error in one of the actions, the log tree node for that action will be expanded. If the build completes with no errors, the top level node will be collapsed. The structure of the build log reflects the order in which actions were executed. 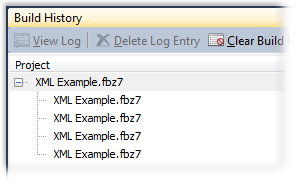 FinalBuilder automatically saves the log to the log archive file with the extension .fblz and the same name as your finalbuilder project. The log for a build can also be exported to Text, HTML or XML. The History & Statistics view shows the archive of log files for a project. 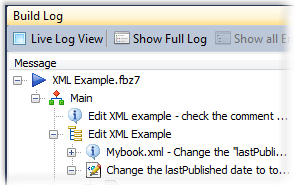 You can configure how many build logs are saved in the the log archive and also view old logs by selecting the log entry and clicking on the View Log button.